This June Storm Returns to Africa! Nrama: So what can you tell us about this story in Amazing X-Men Annual #1? Nero: Hrmm. How to put it in a non-spoilery way. If you love the X-Men, and Storm in particular, you’ll love this. The great thing about an annual is you can simply tell the story you want to tell, you don’t have to worry about what everyone else is doing. You get a satisfying resolution and lots of stirring action all in one, a cool new villain – a thrilling take on Storm. It all ties into crucial elements of her heritage and history, so hopefully it feels really fresh while respecting the traditions. 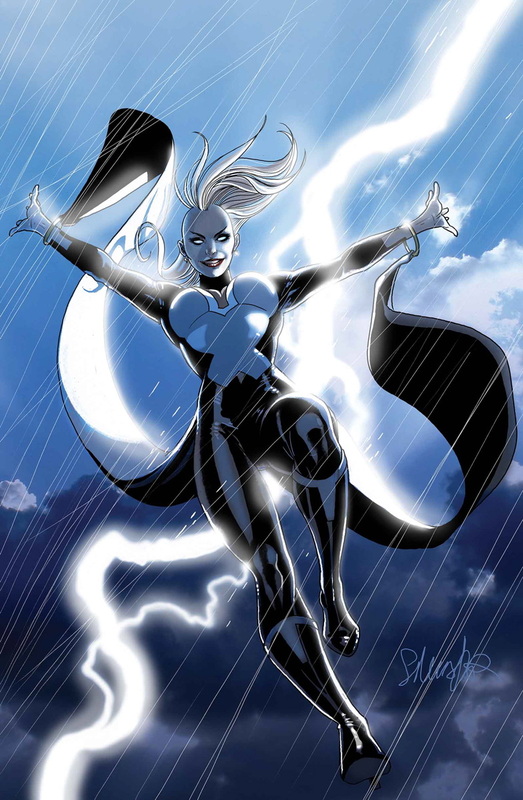 Nrama: This centers on Storm – why choose her for your first Marvel story? Nero: She’s such a great character, and there’s so much untapped potential there. As a writer you’re always looking for the ingredients for a mind-blowing comic, and Storm has weather powers and this fascinating history. I’m really intrigued by all her abilities and characteristics, and how her mind and body works to process it all. Everything about her stirs the emotions in a really visual or lyrical way. I can’t picture a scene with her that doesn’t do something interesting. So it was a golden opportunity to write Storm the way she should be, I was simply very lucky to be the guy who could do that. Sounds good but I’m not getting excited just yet since the last time (in my memory) that the X-men traveled to Africa during Xenogenisis we got tales of a twenty year old condom and a barefoot Storm just for the hell of it. Oh and the dirt poor Africa cliche. You can read the whole interview here and view art below. I’m excited but also hesitant. Hopefully this will be a good story. All we can do is hope Talisha. I want to love it. Nor does he seem to have any insight into her and why she is the way the she and how that shapes the way she acts and reacts to the world . He sounds like a man who is taking on a job. I agree to a certain degree JJ. I actually don’t think the art is so hot, compare this to Larocca’s stint on X-treme X-men and you realize he seems to be phoning this one in…. I feel this same way. I hope we will be proven wrong. I wonder if she will visit or give a call to T’Challa or will that not even come up. Yes, he banished her from ever setting foot in Wakanda since the AvX debacle….but somehow I can’t imagine her not reaching out to him. Or him reaching out to her….. It will probably NOT come up and where do people get the idea he banished her? He didn’t! By the time she was banished his sister was Queen of Wakanda and he was simply a prince. THE COUNCIL that is his sister and the other elders annulled the marriage and branded her a traitor. Ryan, perhaps I mis-read the AvX: VS #5 follow-up (Rumble in the Jungle) where he & she fought. was it not there that T’Challa declared the marriage was annulled by order of the High Priest (T’Challa himself)? [http://static.comicvine.com/uploads/original/1/18863/2532213-bp_1.jpg] also, didn’t Shuri only become queen AFTER Wakanda was nearly destroyed by the Phoenix Force empowered Namor? Regardless, I still think (hope) that their relationship will be revisited if only for a more well planned out resolution and closure. Before these events and AVX came Fantastic four #607-608. At the end Bast makes T’challa king of the dead and Shuri the Queen of Wakanda. It also foreshadowed what occurred in AVX with the destruction of Wakanda’s capitol city. I’m not saying I’m right or your wrong I’m saying it’s all left up to interpretation. + If T’challa annulled the marriage why not say “I” annulled the marriage instead of the high priest? I agree it would be nice to get better closure/resolution to their relationship but this long after I find it doubtful. We can always hope I guess…. Yeah, T’challa hasn’t been the King of Wakanda (who has the second duty of being the High Priest of the Panther Clan) since 2009. Also worth noting guys as we clearly see in New Avengers their is a meeting of elders along with the Black panther a vote is carried out on all decisions and the majority have the finale say. This is all outlined in New Avengers by Hickman. So even if T’challa wanted to stay married he could very well have been outvoted.